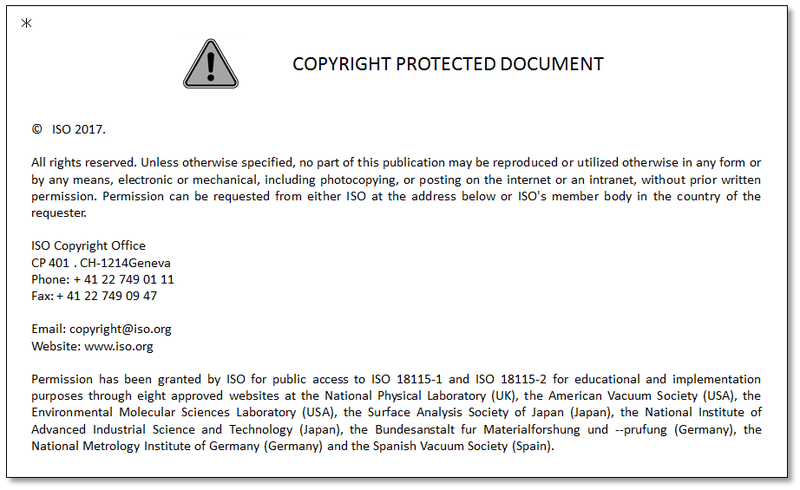 These documents, available from ISO (International Standards Organization in Geneva) or your National Standards Body, cover the terms used in surface analysis spectroscopies such as Auger electron spectroscopy (AES), secondary ion mass spectrometry (SIMS), X-ray photoelectron spectroscopy (XPS) and many similar methods as well as in the scanned probe microscopies (SPM) such as atomic force microscopy (AFM), scanning near-field optical microscopy (SNOM), scanning tunnelling microscopy (STM) and many similar methods. The definitions are also available on the Online Browsing Platform at ISO18115-1* and ISO18115-2*. These links take you to a specific part of the ISO Online Browsing Platform, please wait for about a minute while they load. The general ISO Online Browsing Platform is useful for searching for terms not included in the above standards but that may have been defined in other relevant standards covering the wider spheres of chemistry, optics, etc. It provides all definitions for any given term in ISO standards (click "Terms & Definitions" button) from the different fields so that they may be compared.